This Beautiful Necklace by Michael Machaud is cast in Bronze from a real Boxwood plant in order to capture the plants form and texture. 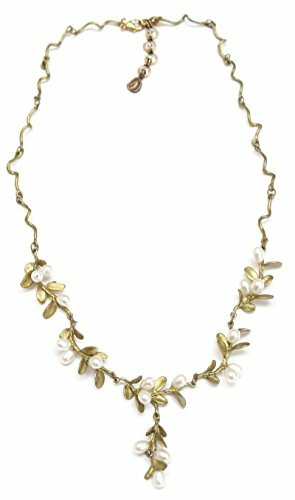 18 White Freshwater Pearls make up the buds that are interspersed half way up the necklace and the twigs climbs the rest of the way up the neckline to the lobster clasp closure. Leaves are layered in Hand Patinaed Green Bronze. Measures: 16"-17" long (adjustable). 14K White Gold Rosary Necklace 2.5mm Bead Rosary Chain Necklace (16, 18, 20 Inches), 20"